BARTLETT, William Henry, 1809-1854 : HASTINGS. [London : George Virtue, 1840]. 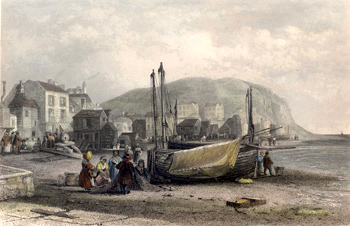 A pleasant antique print – Hastings from the cliffs to the west, the town laid out along the curve of the bay – small boats head to shore. 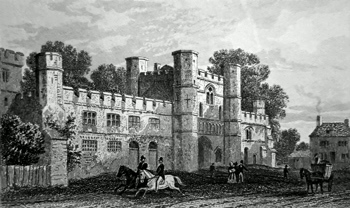 Engraved by Robert Wallis (1794-1878) from an original study by William Henry Bartlett. Originally produced for the part-work series “Ports, Harbours, Watering Places and Coast Scenery of Great Britain” (London : 1836-1842). Steel line engraving on paper. Engraved surface 140 x 186mm (approx. 5-1/2” x 7-3/8”). In very good and clean state. A guaranteed genuine antique print. [ENGLISH SCHOOL] : BATTLE ABBEY. SUSSEX. [London : 1860]. A charming small antique print – two horsemen ride by Battle Abbey. Originally produced for Thomas Dugdale’s part-work survey published as “The Curiosities of Great Britain” or “England Delineated” in various formats between 1838 and 1860. Steel line engraving on paper. Engraved surface 77 x 110mm (approx. 3” x 4-3/8”). In very good and clean state. A guaranteed genuine antique print. [London : 1860 (or earlier)]. An attractive small antique print – a view along the shore, a fishing-boat in the foreground. Originally produced for Thomas Dugdale’s part-work survey published as “The Curiosities of Great Britain” or “England Delineated” in various formats between 1838 and 1860. Steel line engraving on paper. Engraved surface 81 x 113mm (approx. 3-1/8” x 4-3/8”). In very good and clean state. A guaranteed genuine antique print. GROSE, E. : BATTLE ABBEY, SUSSEX. London : Vernor, Hood & Sharpe, 1811. 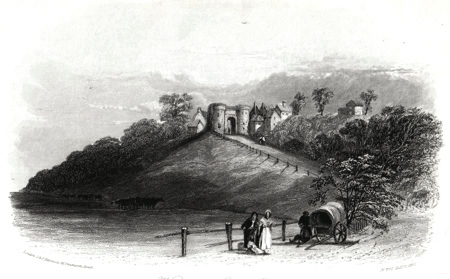 A pleasant antique print – Battle Abbey as it stood in the early nineteenth century. Engraved by Frederick Rudolph Hay (fl.1807-1831) from an amatuer drawing by an artist identified only as E. Grose, Esq. Originally produced for the part-work “Beauties of England and Wales” (1801-1816). Copper line engraving on paper. Engraved surface 106 x 150m (approx. 4-1/8” x 5-7/8”). Trimmed a little tight at foot; a few tiny specks, but overall in very good and clean state. A guaranteed genuine antique print. HARWOOD, John, 1798-1855 – publisher : HASTINGS, FROM THE EAST. 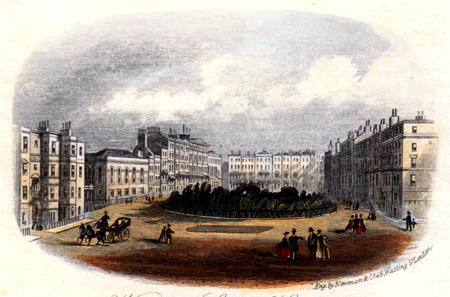 London : J. Harwood, 1845. 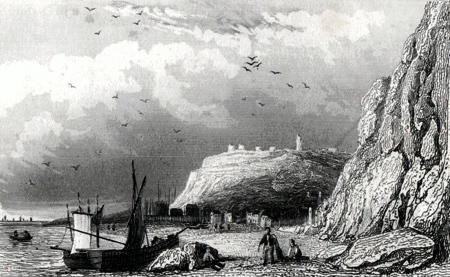 A rare and unusual antique print – an oval vignette view of Hastings from the rocks to the east of the old town. The engraving decorates a double-leaf of ornamental notepaper. Published by John Harwood of Fenchurch Street, well known for producing this kind of decorative stationery. For more on the Harwood family, see my Bookhunter on Safari blog-post for 29th October 2015. Steel line engraving on laid paper. Engraved surface 130 x 167mm (approx. 5-1/8” x 6-1/2”). Slight crease to lower corner of sheet, a few tiny specks, but overall in very good and clean state. A guaranteed genuine antique print. HARWOOD, John & Frederick – publishers : VILLA OF R. HOLLOND, ESQRE. HASTINGS. London : J. & F. Harwood, [ca.1842]. 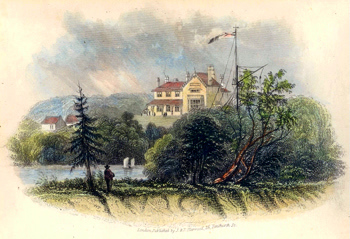 An unusual antique print – an oval vignette view of the handsome house at Hastings of Robert Hollond (1808-1877), the local Member of Parliament, lawyer and balloonist. Published by J. &. F. Harwood of Fenchurch Street. For more on the Harwood family, see my Bookhunter on Safari blog-post for 29th October 2015. Steel line engraving on paper. Engraved surface 113 x 146mm (approx. 4-1/2” x 5-3/4”). A few faint marks, but overall in very good and clean state. A guaranteed genuine antique print. HARWOOD, John & Frederick – publishers : WINCHELSEA GATE, SUSSEX. London : J. & F. Harwood, 1841. A rare and unusual antique print – an oval vignette view of Winchelsea from below, decorating a double-leaf of ornamental notepaper. Dated 1841 in the plate and published by John & Frederick Harwood of Fenchurch Street, well known in their time for producing this kind of decorative stationery. For more on the Harwood family, see my Bookhunter on Safari blog-post for 29th October 2015. Steel line engraving on paper. Engraved surface 106 x 156mm (approx. 4-1/8” x 6-1/8”). A few faint spots to the notepaper, but the engraving itself in very good and clean state. A guaranteed genuine antique print. [London : George Virtue, 1842]. A handsome antique print – vessels on the beach – the tall wooden fish-houses beyond. Engraved by Edward Francis Finden (1791-1857) from an original study by George Howse (fl.1830-1860). Originally produced for the much-admired part-work series “Ports, Harbours, Watering Places and Coast Scenery of Great Britain” (London : 1836-1842). Steel line engraving on paper. Later hand colour. Engraved surface 133 x 179mm (approx. 5-1/4” x 7”). In very good and clean state. A guaranteed genuine antique print. London : J. Walker, 1798. 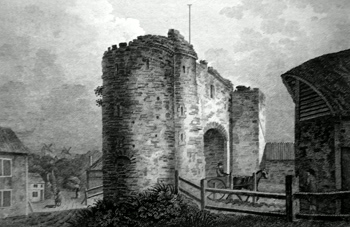 A pleasant antique print – an ancient gate at Rye – two windmills in the distance. Engraved by John Walker (fl.1784-1802) from an original drawing by the antiquary and amateur artist James Moore. Originally produced for Walker’s “The Itinerant : A Select Collection of Interesting and Picturesque Views in Great Britain and Ireland” (London : 1799). Copper line engraving on paper. Engraved surface 122 x 166mm (approx. 4-7/8” x 6-1/2”). In very good and clean state. A guaranteed genuine antique print. NEWMAN, John & BARCLAY, ----- : HOLLINGTON CHURCH. Hastings : T. Ross, [ca.1845]. 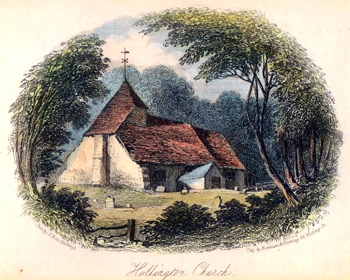 A charming and uncommon small antique print – a vignette view of the church in the wood – St. Leonard at Hollington. Engraved by the London engravers and stationers Newman & Barclay and locally published by Thomas Ross of Hastings. Steel line engraving on paper. Later hand colour. Engraved surface 86 x 104mm (approx. 3-3/8” x 4-1/8”). In very good and clean state. A guaranteed genuine antique print. NEWMAN, John & CO. : WELLINGTON SQUARE, HASTINGS. London : J. Newman, [ca.1850]. A charming small antique print, here with original hand colour and exceedingly rare thus – a vignette view of Wellington Square, Hastings. Produced by the London engraver and stationer John Newman (1813?-1896), the engraving decorates a double-leaf of ornamental notepaper. Steel line engraving on paper. Original hand colour. Engraved surface 73 x 99mm (approx. 2-7/8” x 3-7/8”). A few tiny specks, but overall in very good and clean state. A guaranteed genuine antique print. 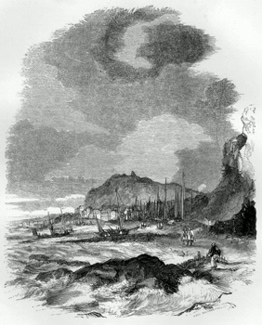 STANFIELD, Clarkson, 1793-1867 : HASTINGS. FROM THE SEA. [London : Smith, Elder & Co., 1836]. A delightful antique print – fishing-boats at sea and the town huddled at the foot of the cliffs. Engraved by William Miller (1796-1882) from an original study by the fine marine painter Clarkson Stanfield R.A., a former sailor and, according to his friend Charles Dickens, “the most loving and lovable of men”. Originally produced for “Stanfield’s Coast Scenery. A Series of Views in the British Channel” (London : 1836). Steel line engraving on paper. Engraved surface 108 x 141mm (approx. 4-1/4” x 5-1/2”). A few tiny specks to blank margins, but overall in very good and clean state. A guaranteed genuine antique print. STANFIELD, Clarkson, 1793-1867 : MARTELLO TOWER. [London : Smith, Elder & Co., 1836]. 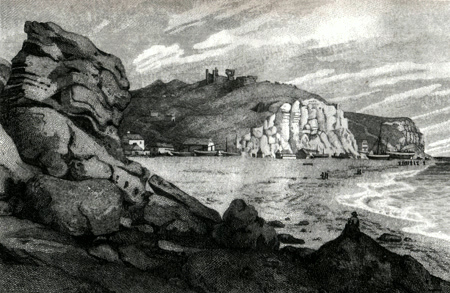 An atmospheric antique print – a Martello tower near Hastings. Engraved by William Bernard Cooke (1778-1855) from an original study by the marine painter Clarkson Stanfield R.A. Originally produced for “Stanfield’s Coast Scenery. A Series of Views in the British Channel” (London : 1836). Steel line engraving on paper. Later hand colour. Engraved surface 102 x 144mm (approx. 4” x 5-5/8”). A few tiny specks, but overall in very good and clean state. A guaranteed genuine antique print. Steel line engraving on paper. Engraved surface 102 x 144mm (approx. 4” x 5-5/8”). A few tiny specks, but overall in very good and clean state. A guaranteed genuine antique print. 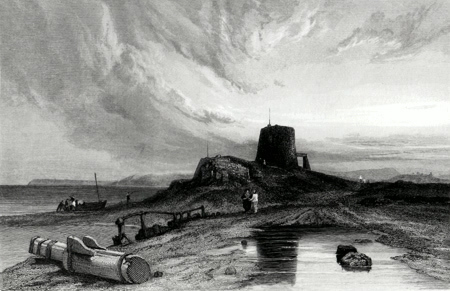 STANFIELD, Clarkson, 1793-1867 : RYE OLD HARBOUR. BLOCKADE STATION. [London : Smith, Elder & Co., 1836]. An attractive antique print – on the coast at Rye in the nineteenth century. 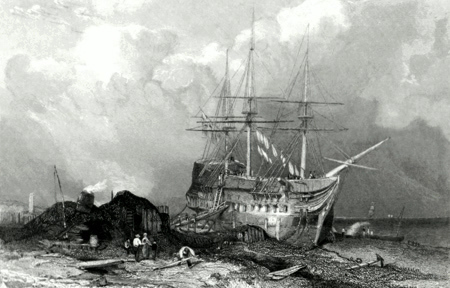 Engraved by J. W. Appleton from an original study by the fine marine painter Clarkson Stanfield R.A. Originally produced for “Stanfield’s Coast Scenery. A Series of Views in the British Channel” (London : 1836). Steel line engraving on paper. Engraved surface 104 x 137mm (approx. 4-1/8” x 5-3/8”). A few tiny specks to blank margins, but overall in very good and clean state. A guaranteed genuine antique print. STOCKDALE, Frederick Wilton Litchfield, 1786?-1858 : BODIHAM [BODIAM] CASTLE, SUSSEX. London : John Harris, 1813. 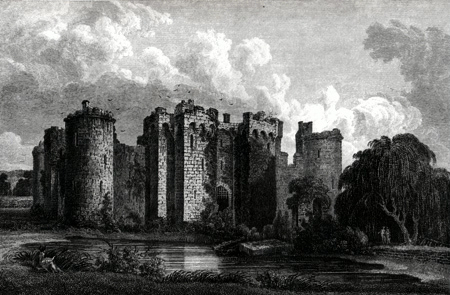 An attractive antique print – the fourteenth-century Bodiam Castle near Robertsbridge. Engraved by Thomas Bonnor (fl.1763-1815) from an original study by Frederick Wilton Litchfield Stockdale. Originally produced for the part-work “Beauties of England and Wales” (1801-1816). Copper line engraving on paper. Engraved surface 117 x 165mm (approx. 4-5/8” x 6-1/2”). Trimmed tight at head, just affecting the image; a few tiny specks, but overall in very good and clean state. A guaranteed genuine antique print. STOCKDALE, Frederick Wilton Litchfield, 1786?-1858 : HASTINGS CASTLE & BEACH, SUSSEX. London : John Harris, 1814. 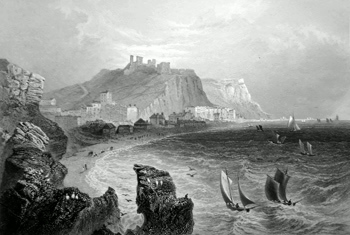 An elegant antique print, Hastings from the rocks to the west – the beach, small buildings on the shore, the castle on the cliff. Engraved by S. Owen (fl. 1796-1838) from an original study by Frederick Wilton Litchfield Stockdale and originally produced for the part-work “Beauties of England and Wales” (1801-1816). Copper line engraving on paper. Engraved surface 109 x 155mm (approx. 4-1/4” x 6-1/8”). A few tiny specks, but overall in very good and clean state. A guaranteed genuine antique print. 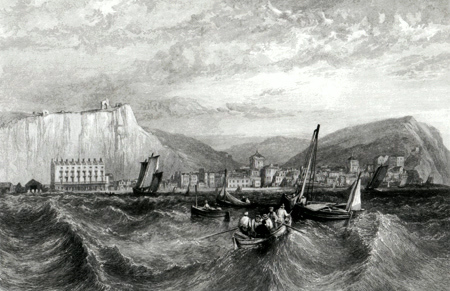 [THORNE, James, 1815-1881] : HASTINGS, FROM THE EAST BEACH. [London : William S. Orr & Co., 1856]. 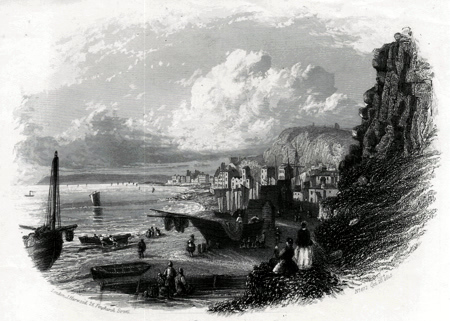 An attractive antique print – an oval vignette view of Hastings from the rocks. Engraved by Frederick William Branston (fl.1830-1849) from an original study by James Thorne. Originally produced in 1847 for the part-work publication “The Land We Live In” (London : 1847-1851) – and here in a slightly later impression. Wood engraving on paper. Engraved surface 181 x 143mm (approx. 7-1/8” x 5-5/8”). In very good and clean state. A guaranteed genuine antique print. 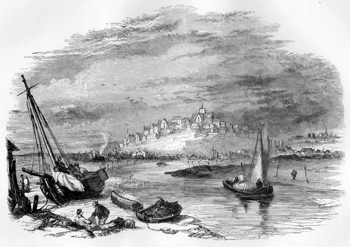 [THORNE, James, 1815-1881] : RYE, FROM THE HARBOUR. [London : William S. Orr & Co., 1856]. An attractive antique print – an oval vignette view of Rye from the water. Engraved by Edward Dalziel (1817-1905) from an original study by James Thorne. Originally produced in 1848 for the part-work publication “The Land We Live In” (London : 1847-1851) – and here in a slightly later impression. Wood engraving on paper. Engraved surface 142 x 195mm (approx. 5-5/8” x 7-5/8”). In very good and clean state. A guaranteed genuine antique print. 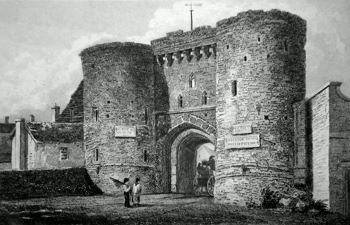 WHITTOCK, Nathaniel, 1791-1860 : LAND GATE, RYE, SUSSEX. London : I. T. Hinton, . An attractive antique print – a coach disappears through the gate – signs to the George Hotel prominent. 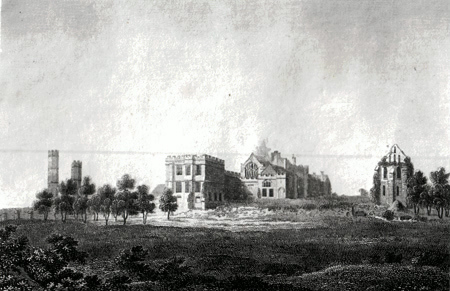 Engraved by J. F. Lambert from an original study by Nathaniel Whittock. Originally produced for the partwork series “Picturesque Beauties of the Counties of Surrey & Sussex” (London : 1829-1831). Line engraving on paper. Engraved surface 117 x 162mm (approx. 4-5/8” x 6-3/8”). A few tiny specks to outer blank margins, but overall in very good and clean state. A guaranteed genuine antique print.